Welcome to our website. We wish you a good visit and we hope to have the pleasure to see you soon in our beautiful region. Do not hesitate to contact us if you have any question or if you need additional information to plan your stay. This beautiful house of mansard style was constructed in 1902 as the village inn. At the time, the clients were mostly commercial travellers, Price workers and tourists. The Perron family owned and operated the place through generations. In 1990, the Perrons closed the inn to visitors and kept the house exclusively as their residence. We became the happy new owners in the fall of 2005. With a lot of patience and a lot of respect, we entirely renovated the place, keeping in mind clients’ needs and comfort along with the preservation of the house’s “little-inn” character. 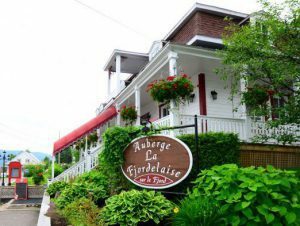 Renamed La Fjordelaise, the inn now counts five warm and welcoming rooms on the second floor, each with a private bathroom. Downstairs, a large living room with its old piano is an inviting place for guests to relax. At the dinning room, we serve copious breakfasts and tasty tables d’hôte. In the summer the balcony is turned into a terrace where the guests can enjoy a delicious meal, while watching the sunset. Since April 2009, we offer you four newly renovated rooms, located in the Rosalie’s House, right next door. In March 2018, we bought Mr. Ernest Boudreault’s and Mrs. Thérèse Chalifoux’s house, our uncle and aunt. We named it the Marie-Hélène’s House after our two cousins, Marie and Hélène. To better accommodate groups and families, the houses are available for rent. See the pages Rosalie’s house and Marie-Hélène’s house for more details. 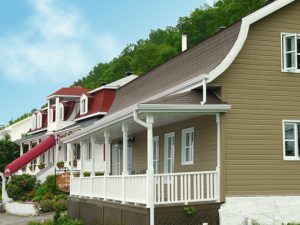 A breathtaking natural setting, a magnificent view over the Saguenay Fjord, cosy rooms, a warm welcome and great food, this is what we have to offer at La Fjordelaise.